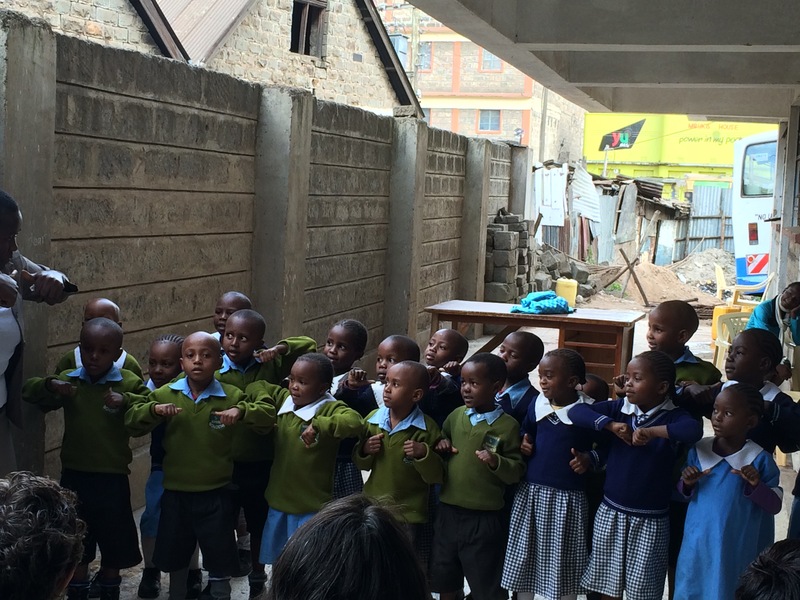 Monday morning the group traveled to Pangani where Missions of Hope International (MOHI) is located. After hearing about the MOHI history the group along with the MOHI social workers was able to walk around the neighborhood and make a few home visits. Once returning to MOHI we toured their vast complex and learned about the programs that are available to the students and community members; including the school and resource center, a laboratory for disease testing, dentist office, doctors office, and pharmacy. The services at the dentist’s and doctor’s offices are offered to the students at no cost and to the entire community for a nominal fee. 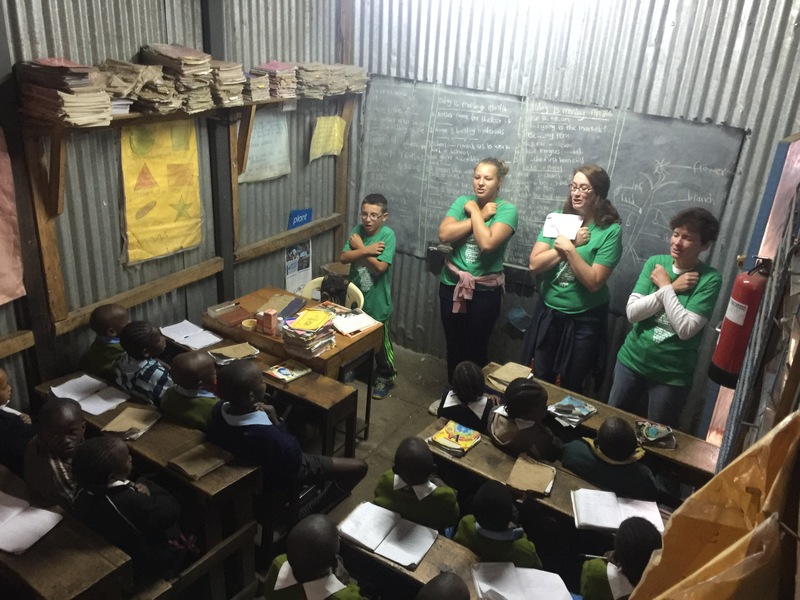 Tuesday was the first day the group worked at the Bondeni School in the Mathare Valley. After taking a tour of the new Bondeni School building, many members of the team went on a prayer walk in the neighborhood with the MOHI social workers. The group walked through the entire neighborhood, which hasn’t been done before by any mission group, because of violence and cleanliness. The group prayed with parents of some of the students about issues of the community including; violence, alcohol abuse, unemployment, domestic violence, and business prosperity. While the majority of the team was on a prayer walk, Jennifer and Jessica were able to make home visits and provide therapy for disabled young adults and show them the love of Christ. After lunch, many members of the team met with the Bondeni children they sponsor. Some team members began to sponsor children long before they first visited Kenya. The sponsor money ensures the child will be able to attend a MOHI school, receive 2 meals a day, and learn the love of Christ. Greater than 75% of the children rely on sponsorship money to be able to attend a MOHI school. Before the group left the Bondeni School for the day we were able to go back into the community and do home visits again with the MOHI social workers. The purpose of the home visits was to tell identified people about the good news of Jesus Christ. The two groups, were able to visit 5 homes and bring 3 people to Christ. The September 2017 Kenya team landed at the Nairobi airport late last night after a long but uneventful trip from Indiana to Kenya. We met up with hosts from MOHI and after an adventurous bus ride and warm welcome from Gracehouse Resort the team settled into their rooms for some much needed sleep. Today is Sunday so the team attended an inspirational church service at the MOHI Church in Bondeni. The service opened with prayer from both our team leader, Jim, and the local church minister, Pastor Stephen. Pastor Stephen, graciously prayed for the United States and the people of Texas and Florida. 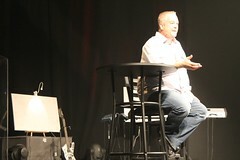 Jim was then blessed to be asked to pray for Kenya. 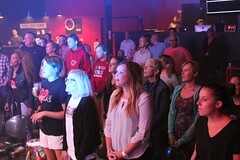 The team was overtaken by the holy spirit when surrounded by the powerful and joyful worship of the Kenyan people. Pastor Stephen taught a compassionate message today out of 1 Thessalonians 1, speaking words of encouragement to the congregation. Pastor Stephen communicated Gods words of hope and love to his people and to our team. It was observed that while the people in this area live in such extreme poverty, they find church is a refuge and Jesus as their hope. After church the team was able to enjoy a beautiful lunch outside at the Gracehouse, reflected on the beauty of Kenya and how today was the perfect way to begin the trip. In preparation for the week’s journey, the group discussed the day’s blessings and prepared the donated items to be dispersed and used when the team gets to interact with the people of the Mathare Valley. God blessed our June 2017 Kenya team to arrive safely Saturday night. We are a team of six. Left to right: Sharon, Dean, Eric, Jeanine, Rachel and Morgan. Sunday morning we attended worship service at Hope Outreach Church-Bondeni. 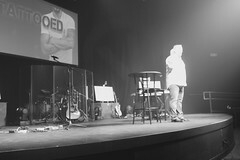 Pastor Tim brought the message from Philippians 2:5-6 entitled Pride and Humility. After service we had lunch at YaYa Center and shopped for souvenirs at the Maasai Market. We enjoyed a much needed kulala followed by Chai time. We had an amazing Kenya dinner consisting of supu, mchele, goat beef, nyama, mbonga, and cake ya matunda. At dinner we met another mission team of six from East 91st Street Church, Indianapolis, Indiana. Today we started with orientation at Missions of Hope building in Pangoni. The programs director, Raphael told the history of MOHi as well as the amazing progress they have made over the last 15 years. After Chai time we split into two groups and toured this area of the Valley. Stopping for several home visits and praying over the families. Because it was a holiday many of the men were not working so we were able to visit the complete family. The children all swarmed us wanting their picture taken and would follow along for several minutes holding our hands and posing for pictures. Like kids everywhere, they love being the center of attention. Upon returning from the walkabout we visited the HOPE Gift Shop. It has items for sale made by the people they have trained in tailoring, beading, and other crafts. The money then goes directly to the person that made the item. We did manage to help the Mathaire economy. We visited the new Kariobangi Training Center and had a tour of the many classrooms they are developing for skills like welding, sewing, hair and beauty, and a computer lab. We finished the day with a wonderful Ken-Mex (Mexican) dinner with Mary and Wallace Kamaus, the founders of Missions of Hope. We arrived back at the hotel and everyone immediately went to sleep. A very long day and we still have a lot to process and share. The day began in the Bondeni Community at the school TPCC supports. Today’s focus was evangelism and insect home fumigation. We visited a total of ten homes. SEVEN PERSONS ACCEPTED JESUS CHRIST AS THEIR SAVIOR AND LORD! After lunch we met with sponsored children for fellowship. Today, we where again in the Bondeni Community. The day started with several more home-visits throughout the village to share the love of Jesus and fumigate for insects. Between our lunch break and going out to do additional home-visits we met with sponsored children to share the love from their sponsor and from our team. Today we were blessed to be able to go into many of the classrooms at Bondeni School. The students so graciously shared songs, dances, and things they’re learning with us. One of our favorite moments was listening to them recite bible verses from heart. We know these teachers are guiding the students to the light of Jesus. Even the little one knew stories from the bible and that Jesus loves them dearly. We loved every minute of our morning with them, and felt the time went so fast. The students left early so that we could present the teachers with some appreciation gifts. 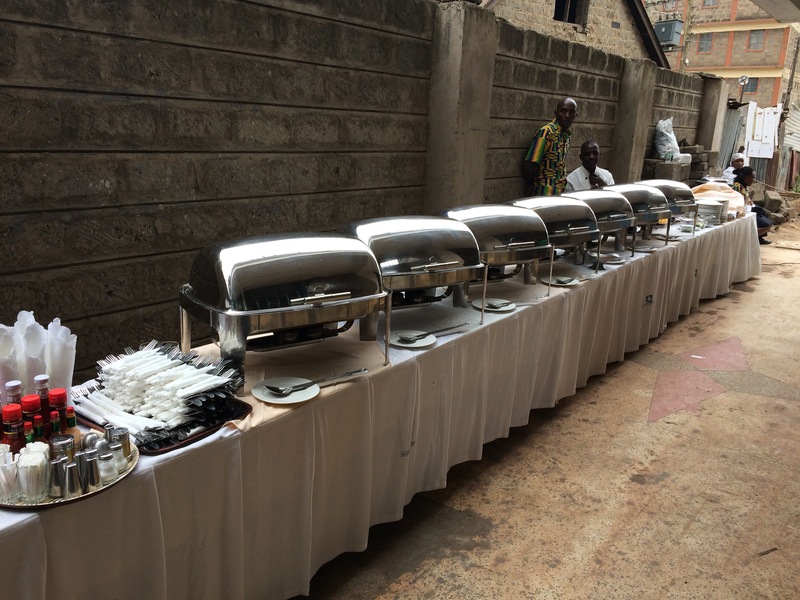 At lunchtime, we were able to serve the entire staff with delicious food from Gracehouse. They filled their plates and enjoyed time with one another. We then presented each member of the staff at Bondeni with a rose and a thank you card. In the card, we gifted them with minutes for their cellphones. They loved it! We felt blessed to see their smiling faces. After a long day filled with love, we hugged and left one another. We are excited for our last day at Bondeni School tomorrow with the students and staff!!! God is good. Today we said goodbye to Bondeni. We started the day with chai and finished visiting grades 3 and grades 5,6,7 and 8. We were able to get the entire school gathered for a photo in front of the new building. After the photo, chairs were set up and the “farewell” program was started. All grades presented us with a gift of song, some were western contemporary worship songs which we recognized and could sing along. The Principal and Center Coordinator both spoke and expressed their gratitude to the team for their sacrifice in traveling so far to serve and thanked Traders Point for their support and helping to build the new school building which has enabled all Bondeni students to be in one central location. Before leaving Mathare Valley, we made a stop at Pangani Center to visit two sponsored children (these were the last two kids we needed to meet with in Mathare). The social worker brought these two little girls to his office to meet with me and receive packages from their sponsors at Traders Point. I noticed that one package was packed with significantly more gifts (as I learned this was only an issue for me as the person presenting their sponsors gifts). 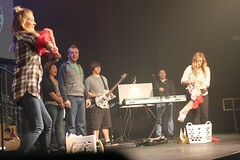 As both children opened their gifts, the child that had a larger number of gifts pulled two large packages of socks from her gift bag. Her eyes and smile lit up the room and she said, “this is so wonderful, but too many socks for me.” She asked me, “can I share a package of socks with my friend?” Her friend happened to be the other girl, who was very content opening her gifts and reading the note from her sponsors. Holding back the tears, I told her of course it was okay to give to her friend, and I am sure her sponsors would be very proud of her for sharing. In a place like Matare Valley where there are so many needs, it was amazing to see such a selfless act of love and kindness. Our final day at Bondeni was a busy day full of activities. 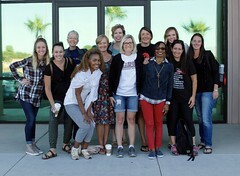 The day began with some of the group splitting off to make final home visits to meet the families of sponsored children. The rest of the group stayed at the school and broke into smaller teaching groups. 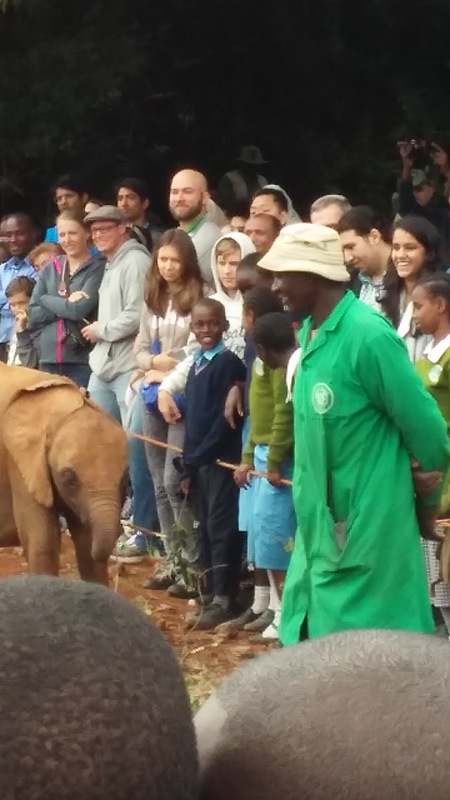 Two groups went into the classrooms to talk with students about their experiences at the elephant orphanage, while a third group debriefed with the Bondeni teachers and delivered the curriculum that will continue the discussions on conservation in the classroom. Right before lunch, the whole group came back together to deliver milk to the children in the school as a special treat with lunch. After this treat, our team transitioned to preparing a surprise teacher appreciation luncheon. The teachers, social workers, and staff at Bondeni work tirelessly everyday to meet the physical, emotional, and spiritual needs of every student in the school. As a team we wanted to recognize and appreciate the staff for their dedicated service to the school. We arranged for a “feast” to be catered to the school by the Grace House staff. For less than the cost of what most Indy residents would pay for lunch downtown, Grace House prepared a beautiful buffet of appetizers, entrees and desserts for the staff. Teachers were given time away from their duties to come and enjoy a lunch together. Afterwards our team prayed with each staff member and presented them with a small bag of gifts and flowers. It was clear that this act of honor and appreciation deeply touched the whole staff. After lunch it was time for the Bondeni staff and student farewell celebration. Our team was treated to performances by the students with song, poetry, and dancing. Our hearts were touched as several members of the Bondeni staff shared words of thanks and gratitude for our service with them over the past week. The celebration concluded with the sharing of a cake and a dance party with the students. It was a bittersweet celebration full of joy and laughter, but also sadness at the realization of the impending goodbyes. After a week at Bondeni new friendships had been made and old friendships had been renewed. We continue to be blessed in working with the MOHI social workers and teachers. Today we were blown away by the amount of caring Rose, a social worker at Bondeni has for Verong Muthoni. She has been working with him to stay in school. He has an elderly grandmother that watches after him after he was orphaned. He uses that as an excuse to skip school and hang out with the wrong crowd. She spoke to him about coming to school and told him he would get food and fun. She even mentioned the field trip we were taking him on and he showed up today! Here’s a picture of him enjoying the elephants and trying to feed them. It was great to have him with us today!